Sometimes even the unlikeliest of stories take flight. Emily Rueb learned this lesson, when her idea of Hawk Cam, a camera focused on a family of red-tailed hawks in New York City, garnered worldwide attention. Rueb, a Senior Producer and Metropolitan Diary editor at the New York Times, shared this wisdom with the Future of Journalism class. Her visit was part of a New York Times readership program that encourages students to read the iconic newspaper. Rueb said many of her stories come from just observing life and thinking about her audience. This lead her to the idea of Bird Week, which she said was like shark week, only with birds. Focusing on birds was met with skepticism in the newsroom, but when she started Hawk Cam, responses from all over the city and the world began to pour into her inbox. Something I learned from the ’Hawk Cam’ experience is that readers are your biggest resource, Rueb said. And you should reward their contributions. Freshman Katy Andersen said she found Ruebs success with the Hawk Cam encouraging. It’s interesting that her live stream of a red hawk and its family, what her colleagues once deemed as insignificant, became such an online hit, Andersen said. I learned from Emily that as a Journalist, I should follow my passion and instincts, even when others may doubt me!" 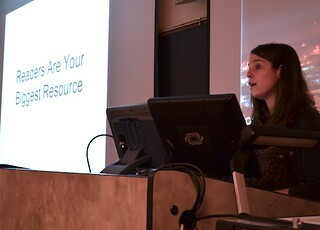 Beyond the Hawk Cam Rueb discussed her role in multimedia production, urging students to find whats interesting and emotional and use the best medium to tell the story. Rueb worked on the award-winning series Abused and Used with New York Times investigative reporter Russ Buettner, who had visited the class two days earlier. Freshman Erin Davoran said she appreciated Rueb sharing her journalistic adventure. I love how she encouraged us not to crush the creative spirit but at the same time be willing to totally fail, Davoran said. Emily seems to be embracing and mastering the changes in the media world. She is open to learning new things and teaching herself new skills when the job or story calls for it. I think that attitude not getting comfortable with what you know, but adapting to the given situation is very inspiring.